These two carpets were designed for a luxury villa in Caesarea. The armchair in the living room is by Italian furniture designer Giorgio Saporiti, a tribute to the year 2000. The living-room carpet, “Making a Point”, complements the sofa and armchairs in subdued colors, with just enough color and shape to give the scene the desired panache. 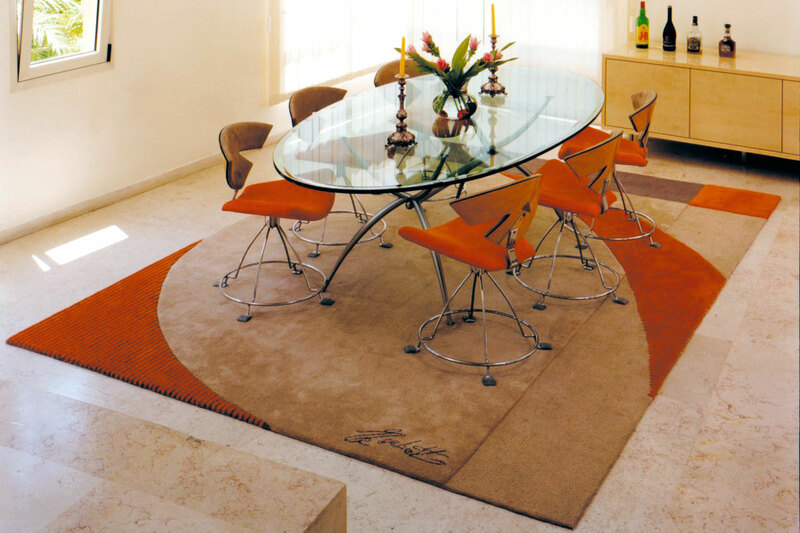 The dining room carpet, “Brave Beige”, stresses the pointy corners, contrasting them with the rounded protrusion to get the message across, in this deceptively simple-looking carpet. A Whirlpool of Music & colors! !